I don't really enjoy drinking softdrinks. There just no choice at times. That's why I've started bringing my own supply of bottled mineral water to where ever I go. Since then, I've also been able to cut down meal costs since I don't purchase drinks anymore. With that, I give you my top choices for food on a budget of P55. or less. 1. Wendy's Super Value items - Chili Rice, Side Salad, Hamburger are anywhere from P25 - P29. and delicious. You can buy any two items for less than P55. 2. Yakitori King - 1 piece yakitori on a barbeque stick with lots of rice and pickles on the side in a cool foldable box for P41. Lots of Yakitori sticks to choose from. I learned to love Yakitori during my 2 day stay in a Japan airport. 3. Chowking Chicken Noodles - get the meryenda size bowl for P49. You'll have hot soup, tasty noodles flavored with chicken strips and strips of vegetables. 4. 7-11 Meal #3 - My all time favorite. I buy this when I'm going home and it's late and I haven't eaten dinner yet. Meal #3 is a Jumbo hotdog (your choice of Regular, Spicy, Mexican, Beef or Super Hot) and a drink. I usually get a slurpee. Their Manhattan dressing is excellent for the hotdog. All for only P36. 6. 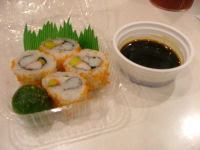 Tokyo Tokyo California Maki - 4 pcs. for P39. It's more of a snack and you won't get full with ordering this but it's a good way to trick your stomach of being full for an hour or two. 7. Komorosoba merienda budget meal - Their only surviving branch is at Megamall. Their katsudon meals are the best. And what's better is that they have a smaller serving size during the afternoon for only P49. Add P10. and get an additional iced tea with that. 8. Gardenia Chocolate Bun - this is handy if you happen to pass by a supermarket. This is a handy piece of food you can eat while driving, commuting or just about anywhere. It looks like a cross between a siopao and hamburger which cholocate filling. It goes for around P12.50. Buy 2 pieces. Also comes in strawberry and ube. 9. McDonalds Coupon Meals - only until March 31, they've given away coupons for discounted meals. Those under P55. are the Burger Mcdo Meal (P29. ), spaghetti meal (P39.) and 1 piece chicken without drink (P47.). You can also buy a french fries snack with drink for P29. I wouldn't recommend the spaghetti though. I feel it tastes much inferior to any other spaghetti in the market. 10. Pizza Hut Buy 1 Take 1 slice - my personal favorite food when I'm in a hurry. Two slices for P49. with your choice of Hawaian or Ham & Cheese. I love French Baker Mocha!